Self-proclaimed “trash poet” John Wesley Coleman III incorporates indie rock slack with witty storytelling in his music. Hailing from Irving, Texas and living much like a drifter in East Austin, Coleman started engaging himself in a variety of creative activities in the mid-2000s: performing with psychedelic five-piece Golden Boys, doing standup comedy, painting, writing books and movie scripts, and recording solo material. His full-length, Steal My Mind, was issued in 2009, before Goner Records released Bad Lady Goes To Jail in 2010. 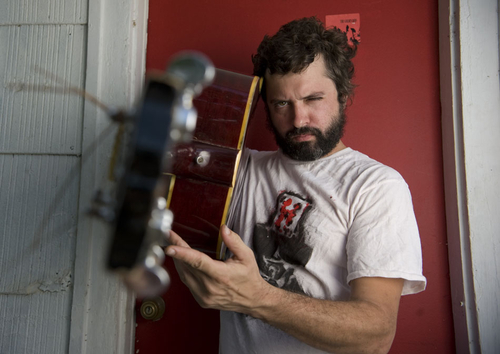 Coleman returned in 2012 with The Last Donkey Show, recorded in Oakland, California at Greg Ashley’s Creamery studio, and at a friend’s childhood home in Lockhardt, Texas, offering more of his uniquely colorful tales and a hint of maturity. JWC III is playing with OGG and Eric Wright at The End this Sunday (Dec. 9th).